The reason I live on the top floor........this one visited my neighbours downstairs. I can't imagine finding this on my doorstep one morning! Great page and I love the leaves you added. Fantastic drawing !!! But I'd rather look at it on paper than for real !! I'd be terrified ! I still wonder how you can have so beautiful and rich watercolours(?) on this fussy thin paper !! You are so diverse! Wow! This is awesome, even though I'm afraid of snakes. I do love your work! 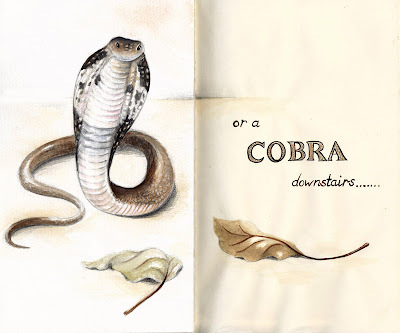 Debra - You are so brave to draw a live snake. I would drop everything in my hand and run faster than an Olympic sprinter. interesting (and unwanted) house guest!!! whoa!!! !